Where you can find information on? What is the Energy-Saving Marathon? How can we generate energy in Barcelona? How much energy can you generate? How to get an energy supply? Here you will find information on anything to do with the energy model, energy supply, energy saving and power generation, in fact, everything you need to know, in the three languages. the adjustment of human and natural systems to new or changing environments. a system used to control the air temperature and humidity level so that it feels pleasant to the human body in premises, a room, a vehicle or a closed space. an area where the maximum values for the immission of substances or suspended particles are being exceeded and the competent authority has declared it as such. a parameter that indicates the composition of the air, and which gradually falls as the concentration of pollutants increases. NB: air quality is evaluated by comparing imission levels with the maximum levels allowed by current legislation, which indicate the approximate level at which there might be a negative effect on health. a type of electric current characterised by periodic changes in intensity or direction. The voltage varies between its maximum and minimum values in a cyclical fashion. It has a positive value half the time (positive semi-cycle or semi-period) and negative the other half. the light produced by a lighting device. the gaseous layer that surrounds the Earth. NB: the main gases that make up the atmosphere are nitrogen, oxygen, water vapour, argon and carbon dioxide. pollution caused by the presence of some chemical compound in the atmosphere that is not part of its normal composition, or natural composites in a higher-than-usual concentration. an electrochemical generator that produces a continuous tension by means of a chemical reaction and which principally consists of an electrolyte and two electrodes, positive and negative. NB: used batteries are regarded as special municipal waste and are subject to separate waste collection. a set of operating procedures for staff, management and the control of industrial activities that foster waste and emission minimisation. NB: appropriate procurement and stock management, efficient preventive or predictive maintenance and proper control of process variables are examples of best practices. These can generally be implemented at very little cost and, therefore, with a rapid return on investment. This is one of the most effective ways of minimising waste and emissions. a synthetic liquid biofuel obtained from vegetable oil and animal fats. energy obtained from biomass by fermentation, combustion or other processes, such as gasification or pyrolysis. fuel derived from biomass, which is treated to obtain an aggregate with a high calorific value that comes directly or indirectly from the capture and fixation of solar energy in photosynthesis processes. NB: biofuels can be solid (wood, bricks, pellets or charcoal), liquid (biodiesel, bioethanol, biopropane or butanol fuel) or gaseous (biogas). a combustible gas comprised of a mixture of methane and carbon dioxide that is produced by the anaerobic digestion (controlled or not) of biomass. the total quantity of organic matter in a given area or ecosystem. NB: 1) dry matter weight per surface or volume unit is the measurement used for biomass. 2) in sanitation, the term biomass specifically refers to the active quantity of microorganisms in a biological reactor that carry out the biological oxidation of organic matter in sewage. the layer of Earth where life develops and which includes parts of the lithosphere, hydrosphere and atmosphere, into which all human beings are integrated. an electric light bulb consisting of a vacuum-packed glass globe with a metal filament (usually tungsten) that produces incandescent light when an electric current passes through it. the parameter used to indicate the maximum amount of energy that can be generated by a fuel, or a waste product used as fuel, when it is burned. a colourless, odourless, insipid gas formed by natural biological processes with complete carbon oxidation as a result of deforestation, or by the combustion of fossil fuels and organic matter with an excess of oxygen. NB: the principal effects of this atmospheric pollutant are the appearance of climate change and an increase in global warming. an indicator of the greenhouse gas emissions associated with the life cycle of a product, service or organisation. a colourless, odourless, toxic, inflammable gas that results from the incomplete oxidation of carbon by oxygen. NB: the main emission sources of this atmospheric pollutant are fuel-burning plants and cars. It is an asphyxiating substance that reduces the atmosphere’s self-cleaning capacity. a flue that provides an outlet for smoke, gas and particles generated by combustion, a chemical reaction or product storage, or which responds to the ventilation needs of an activity. an economic model based on reusing, repairing, remanufacturing and recycling products and materials, keeping the use of raw materials to a minimum, as an alternative to a linear model based on production, use and disposal. energy which can be obtained and used without generating waste, has moderate to minimal environmental impact and produces no chemical or noise pollution. NB: examples are solar power, wind power and geothermal power. a type of industrial production that minimises its environmental impact by means of careful resource management, proper product use and design, waste reduction and design, the use of clean technology and so on. the continuous application of an environmental prevention strategy that is integrated into products and processes in order to reduce the risks that might affect people and the environment. NB: in production processes, the concept of cleaner production includes conserving energy and raw materials and reducing the amount and toxicity of waste and emissions. The UNEP (United Nations Environment Programme) often uses this concept to point out that work in this field is continually under way and advancing. a set of atmospheric conditions that characterise the weather in a specific region. adjustments in the climatic characteristics of a specific place over a period of time. NB: climate change may be due to natural causes or phenomena resulting from human activity, which increases the concentration of greenhouse gases in the atmosphere. a brown or black solid matter that results from the partial decomposition, distillation and incomplete combustion of organic matter, usually vegetable, which contains carbon. NB: coking coal, mineral coal and charcoal are distinguished by their production process. the combined production of electricity (or mechanical energy) and heat energy from a primary energy source, such as natural gas, diesel or fuel oil, which is later reused. NB: the most common cogeneration systems are those based on steam turbines, combined cycle (gas turbine and steam turbine) and reciprocating internal combustion engines. a plant where a primary fuel such as natural gas, diesel fuel or fuel oil is used to generate thermal energy, which can be used later, and electric power. a chamber built under specific conditions where fuel or waste used as fuel is burned to take advantage of its calorific value or heating power. an apparatus which is used to oxidise fuel in order to use the heat generated in this process. a measure designed to soften the environmental impact envisaged by a project or produced by a specific activity. a colourless or slightly yellowish liquid fuel obtained by distilling petroleum fuel oil at a temperature between 220 and 360oC, which is mainly used as transport fuel though it has other uses. NB: diesel is the fuel used with diesel engines. When these engines are well-regulated they emit fewer pollutants than petrol, however, if they are not, they emit more suspended particles and black smoke. a type of electric current where the direction of the charge-flow circulation does not vary. The continuous current is normally used for applications that require a low voltage, especially where energy is produced by batteries or photovoltaic solar energy systems. a company’s capacity for minimising pollution and the use of resources, including energy resources, during the process of elaborating a product from the design stage to packaging and distribution, without reducing its quality. a set of changes that a natural process or human activity produces in an ecosystem. the branch of biology that studies the relations between living beings and their environment. a functional unit consisting of a biotope and the living organisms that inhabit it, with all the relations and exchanges of matter and energy that take place there. a set of techniques that consist of rationalising the management of raw materials and energy sources in order to minimise pollution. education designed to raise awareness and understanding, and encourage people to become involved in protecting and improving their surroundings and in the process of sustainable development. a group of electric accumulators connected in series or in parallel. NB: old car accumulator batteries are regarded as special municipal waste and are collected separately at municipal tips. the accounting and location of emissions discharged into the atmospheric in a specific area. the quantity of pollutants released into the atmosphere during the course of a specific time period. NB: it is measured as mass per unit volume of pollutant. the emission level that must not be exceeded, in accordance with current legislation. a system’s capacity to produce external force. NB: it may take the form of mechanical, electrical or thermal energy, and chemical or physical bonds. an energy-rating document that officially identifies and certifies the power consumption and energy efficiency of certain products, such as housing and electrical appliances. The rating is based on a scale of 7 letters, where A identifies maximum energy efficiency and G the least efficient products. NB: energy certificates are issued by an independent third party. the amount of energy consumed in a specific period. the degree to which an optimum relationship is achieved between the resources used in energy management and the results obtained. energy that crosses a surface perpendicularly per unit of area and unit of time. NB: the unit for measuring energy flow in the international system of units is watt per square metre, W/m². a voluntary rating system that officially identifies and certifies the energy consumption and efficiency of certain products. NB: energy labels are awarded by an independent third party. Utilising waste to produce energy as an alternative to other sources. the rights that establish energy as a commodity of prime necessity, with equal and universal access at a fair price guaranteed to ensure a decent life for everyone. a procedure that allows a reduction in energy use and consumption while achieving the same result. energy that can be turned into useful energy. NB: potential, kinetic, wind or chemical energy can be transformed into electrical or mechanical energy, and so on. involves obtaining and distributing energy (gas or electricity) on a regular and reliable basis by means of a functional system of works, plants, facilities, grids and pipelines. biofuel used in transport that is obtained by mixing hydrocarbons derived from biomass. NB: there are two types of biofuels for transport: bioethanol and biodiesel. a set of biotic (fauna and flora) and abiotic elements (solar energy, water, air and mineral earth) that combine in a particular space and affect the development and survival of an organism, and also enable ecosystems to develop. adverse effects produced by a project, work or activity on the characteristics of the environment. the systematic monitoring of environmental conditions with a view to preventing harmful changes. set of indicators that show the state of the environment at a specific time in a specific place. in a gas-discharge lamp light is mainly produced by the emission of a layer of fluorescent substances inside the lamp which are stimulated by the ultraviolet radiation of the discharge. NB: the waste treatment of fluorescent tubes is a public service offered by the regional Catalan government. a gas-discharge lamp where light is mainly produced by the emission of a layer of fluorescent substances inside the lamp which is stimulated by the ultraviolet radiation of the discharge. NB: the waste treatment of fluorescent tubes is a public service offered by the Catalan government administration. see fluorescent lamp / bulb. the fuel resulting from the partial decomposition of organic matter due to physical and chemical changes caused by pressure and heat over millions of years. NB: coal, oil and its derivatives, and natural gas are fossil fuels. the reducing agent in combustion. a liquid fuel used in combustion engines. NB: usually petrol or diesel but it might also be natural gas, fuel, kerosene, bioethanol or biodiesel. a lamp that produces light by means of an electric discharge between electrodes in a gas or vapour at low or high pressure. energy that comes from harnessing the thermal energy of the subsoil and geothermal deposits. the acronym in Catalan for Gestor Integral de l’Ordenança Solar (Solar By-law Integral Manager), online software developed by Barcelona City Council to simplify the procedures for obtaining the municipal licences required by projects for installing thermal and photovoltaic solar energy facilities, in accordance with the procedure set out in the Barcelona Solar By-law. a set of adjustments in natural, physical or biological systems, the impacts of which cannot be localised because they affect the whole of the planet. the process whereby the Earth’s temperature is gradually increasing due to the intensification of the greenhouse effect. an economic model that aims to improve human well-being and social equality, while significantly reducing the risks to the environment. a phenomenon consisting of atmospheric warming, which is due to the fact that the atmosphere is transparent to solar radiation and its capacity to absorb the Earth’s infra-red radiation. the natural or anthropogenic gas in the atmosphere that absorbs and emits radiation on specific wavelengths of the infra-red radiation spectrum emitted by the Earth’s surface, the atmosphere and the clouds. NB: the GHGs include carbon dioxide (CO2), methane (CH4), nitrous oxide (N2O), hydrofluorocarbons (HFCs), perfluorocarbons (PFCs), sulphur hexafluoride (SF6) and nitrogen trifluoride (NF3). the total mass of greenhouse gasses released into the atmosphere in a specific period. each of the electronegative, non-metallic chemical elements with the capacity to combine directly with a metal and a tendency to form monovalent anions (atoms or groups of atoms). NB: the halogen group includes fluorine, chlorine, bromine, iodine and, less importantly, astatine. a lamp or bulb filled with gas that contains a certain portion of halogen or an organic halogen compound. the manifestation of a system’s internal energy which is measured via temperature. equipment or devices designed to heat a space. NB: it generally consists of a closed circuit through which air or water circulates at a temperature above room temperature. The fluid can be heated by combustion, which may involve pollutant emissions. an organic compound formed by carbon and hydrogen. Its initials are HC. NB: the main sources for the emission of these atmospheric pollutants are incomplete fuel combustion, vehicle traffic, some organic matter combustion processes, oil refineries and organic dissolvents. The principal effect of hydrocarbon is the appearance of photochemical smog. electrical energy produced by harnessing the potential or kinetic energy of water. a power plant that captures the mechanical energy of falling water and converts it into electric power. energy that comes from harnessing the potential energy of falling water or kinetic energy of fast-running water. the photometric magnitude that measures the luminous flux a surface receives. NB: 1) Lighting can be natural or artificial. 2) It is represented by the symbol E. 3) The unit of measure for illumination in the international system is the lux, which corresponds to 1 lumen per square metre (lm/m2). an electric lamp consisting of a vacuum-packed glass globe with a metal filament (usually tungsten) that produces incandescent light when an electric current passes through it. an engine powered by a fuel burned in a closed space inside the engine itself, which gives rise to a reciprocating motion. the acronym for Light Emitting Diode. A semiconductor diode that emits incoherent light on one of the bands of the visible spectrum, infra-red or ultraviolet, when an electric current is passed through it in the direction allowed by the diode. NB: an electroluminescent diode consists of two semiconductor materials that form a p-n junction. When an electron passes through the junction from the negative side and finds a hole corresponding to a lower energy level, it emits energy in the form of a photon. The colour emitted by the diode depends on the energy jump between the materials in the p-n junction. a mixture of light hydrocarbons, principally propane and butane; gases under normal temperature and pressure conditions that are liquefied. a lamp based on fluorescent tube technology that is smaller and consumes less energy than an incandescent lamp. the biological process involving the anaerobic decomposition of organic compounds to obtain biogas. a saturated, gaseous, colourless, odourless and inflammable gas mainly formed during the anaerobic decomposition of organic matter. NB: the main anthropogenic emission source of this atmospheric pollutant is anaerobic decomposition at landfill sites, sewage treatment plants, animal-breeding farms and so on. The principal effect on methane is the intensification of the greenhouse effect. the anthropogenic or human intervention to reduce emission sources and improve greenhouse gas sinks. a fossil fuel found in underground deposits that is formed by a mixture of hydrocarbon gases, mainly methane, with a low molecular weight. a light comprised of electromagnetic waves that vibrate on different wavelengths over time. a non-metallic, gaseous, diatomic, colourless, insipid, odourless and chemically inactive chemical element that makes up approximately 80% of the volume of air in the atmosphere. NB: when it is combined with oxygen at high temperatures it forms nitrogen oxides. a dense, colourless, pungent and highly irritant gas that comes from natural processes or is the result of burning fossil fuels that contain sulphur, especially coal and oil. NB: it is one of the basic indicators of atmospheric pollution. The principal effects of sulphur dioxide are acid rain and a reduction in visibility. an insipid, colourless, almost odourless and highly toxic gas formed by the direct combination of nitrogen and oxygen in the air at high temperatures. Also known as nitric oxide. NB: this gas oxidises in the atmosphere and nitrogen dioxide (NO2), with which it forms what are known as nitrogen oxides. It is highly toxic if inhaled and it irritates the skin and mucous membranes. each of the gases that result from the oxidation of atmospheric nitrogen through combustion due to the effects of temperature and pressure. NB: the most important nitrogen oxides as regards atmospheric pollution are nitrogen dioxide (NO2) and nitrogen oxide or monoxide (NO). The main sources of emissions of these atmospheric pollutants are combustion processes at high temperatures and certain industrial processes. The principal effects of nitrogen oxides are photochemical smog, the greenhouse effect and acid rain. a type of fuel capable of undergoing a controlled fission reaction in a nuclear reactor that releases energy in the form of heat. NB: Uranium and plutonium are nuclear fuels. a nuclear reaction in which new atomic nuclei are formed by existing nuclei combining with lighter ones lacking mass, releasing large amounts of energy. NB: this release of energy is explained by the equation E = mc2, where m is the difference in mass and c is the speed of light. energy obtained from atomic nuclear fusion or fission. a power plant that turns the energy released by atomic nuclear fission into thermal energy. a complex of industrial facilities that use mixtures of hydrocarbons in crude oil or petroleum to produce petrol, lubricants, liquid gases, asphalt, etc. a non-metallic, gaseous, diatomic, colourless, insipid, odourless chemical element found in its free state in the atmosphere, of which it makes up approximately 21% of the volume. a light blue, irritant gas, a triatomic allotrope of oxygen with a characteristically sharp smell that absorbs short wave ultraviolet radiation. NB: in the presence of atmospheric pollutants such as nitrogen oxides or some hydrocarbons, intense solar radiation can cause a strong concentration of ozone in the troposphere. In these conditions, ozone becomes a very toxic and corrosive photochemical oxidant that can intervene in atmospheric phenomena such as the oxidation of nitrogen. the layer in the stratosphere, spanning altitudes between 20 and 50 km, where the concentration of ozone is at its highest at 25 km and lowest above 50, or 70 km, in certain areas of the planet. NB: the ozone layer filters some of the sun’s ultraviolet radiation. a small cylindrical or spherical body obtained from compressing finely divided dry materials. NB: wood and similar waste materials are used to make pellets in the energy sector. a highly flammable, colourless liquid obtained by distilling petroleum at a temperature between 60 and 200 oC, or by cracking the heavy petroleum fractions, and which is mainly used as fuel for transport. NB: unleaded petrol contains antiknock organic compounds rather than leaded compounds. a mineral oil formed by a mixture of hydrocarbons with diverse structures in highly variable proportions, depending on the oilfield of origin. the ability of light to release electrons from a metal surface. This effect is applied to photovoltaic panels, to generate electricity from sunlight. electricity generated by means of the photoelectric effect. the introduction of disturbances, radiation or materials into an environment, generally as a result of direct or indirect human actions, that alter the properties and modify the structure and function of the ecosystems that are affected. a range of facilities where electric power is produced from another form of energy. a measure adopted during the planning, design or development stages of an activity to avoid the negative effect it might have on the environment. the principle according to which a specific area has to be capable of accommodating the facilities and management systems to adequately handle the waste it generates. a series of educational and communicative actions aimed at bringing about change in public consciousness so we can advance towards environmentally sustainable situations. fractions with a high calorific or energy value produced from waste that is processed to recover energy or to be used as a substitute for fossil fuels. energy obtained from inexhaustible or renewable sources. NB: for example, the energy obtained from charcoal and wood. an ecosystem’s capacity to react positively to restore its properties and functions following the action of a disruptive process or agent such as acid rain, erosion or pollution. NB: in terms of individuals and society, resilience is the capacity to face up to an unfavourable situation or one that poses a risk, and to recover, adapt and develop positively in the face of adverse circumstances. the principle requires that a specific area has facilities and management systems available to adequately handle the waste it generates. a type of fog that contains air pollutants, principally from industry and transport emissions, the consequence of a large concentration of dust and smoke particles which act as condensation nuclei, causing the condensation of water vapour, even when air humidity is well below 100%. a type of light used on public roads and streets which emits a yellow light, consumes less energy than ordinary lights and does not attract insects. NB: this is an alternative light to mercury, which emits white ultraviolet light and attracts those insects. a device used to collect incident solar radiation to turn it into thermal energy for domestic and industrial uses. a device with a large surface area used to capture solar radiation which is converted into heat (thermal solar energy) or electricity (photovoltaic solar energy) and can be used for domestic or industrial purposes. radiant energy emitted by the sun in the form of electromagnetic waves. a power plant that uses the energy radiated by the sun to produce electricity. the electromagnetic radiation emitted by the sun, 90% of which has a spectrum that falls between 0,25 and 5 µm, approximately. a solar power station that makes use of solar radiation to heat a fluid which, once vaporised, can be used to drive a set of turbogenerators. a zone where there is a situation that gives rise to a very high potential risk of exceeding the admissible limits, or where the admissible immission limits have already been exceeded, and where the actions and measures that can be adopted in situations where a special attention zone has been declared are considered to be insufficient. each of the gases that result from the oxidation of sulphur and hydrogen sulphide (H2S) in burning fossil fuels, in the decomposition and combustion of organic matter, and the aerosols over oceans and volcanoes. NB: the most significant sulphur oxides as regards atmospheric pollution are sulphur dioxide (SO2) and sulphur trioxide (SO3). The mains source of emissions of these atmospheric pollutants is the burning of fossil fuels in power stations, cars, heating systems and so on. The principal effect is acid rain. a set of solid or liquid particles less than 30 µm in diameter, approximately, with a low sedimentation speed and a relatively long residence time in the atmosphere, depending on their density. NB: 1) They are found in dust, emissions from industrial processes, smoke produced by burning wood and coal, vehicle exhaust fumes, etc. 2) Depending on how big they are, they can be classified as inhalable or non-inhalable. a set of policies designed to make economic growth compatible with maintaining biodiversity and ultimately, preventing the degradation of the biosphere caused by human activity. something that enables the regeneration of resources and the environment. heat energy produced by burning coal, oil, natural gas and other fuels in thermal machines. a high concentration of particles in the form of a cloud that are dangerous to life and health. describes a system of production and consumption that is not compatible with the rational exploitation of or respect for the environment. the branch of ecology that studies urban ecosystems and sees aggregate urban settlements as systems constituted by a community of organisms (of which mankind is the most important) and the environment they live in. the exorbitant and uneconomic consumption of any kind of resource. a set of wind turbines that work in parallel and use wind power to produce electricity which enters the distribution grid. energy that comes from harnessing the kinetic energy of air. a power plant that harnesses wind power. a building where net energy consumption is close to zero in an average year. NB: the energy it uses comes from the building itself via renewable energy sources. This programme, also known as the Barcelona Reserved Job Market, fosters employment for people who have difficulty in accessing the job market. It is led by Barcelona City Council's Municipal Institute of Social Services, with the collaboration of social organisations, represented by ECAS (Catalan Social Action Organisations), FEICAT (Placement Companies of Catalonia) and the Red Cross, as well as the city's business community. This is a job market reserved for people at risk of social exclusion, where organisations find the person best-suited to the contractual needs of a post, following skilled-employment criteria. Networking between Social Services and a team of professionals makes it possible to give advice and support in selecting the best profile, and provide individual support for candidates and their adaptation to the new job. The Labora Programme links companies to a social-responsibility programme while also arranging for various economic sectors to take part in an initiative that works to promote equal opportunities for the general public. In this sense, companies in the renewable-energy sector benefit from economic incentives and bonuses for hiring people who are registered with this programme. 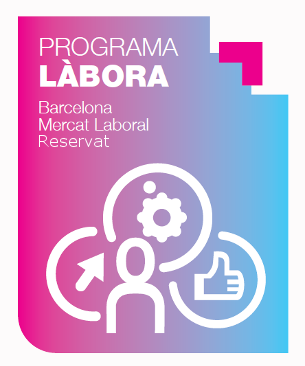 Companies interested in collaborating with this programme should send an email to labora@bcn.cat or phone 93 256 56 23.